At Shasta Critical Care Specialists our primary concern is patient care and service for both our outpatients and patients at area hospitals. 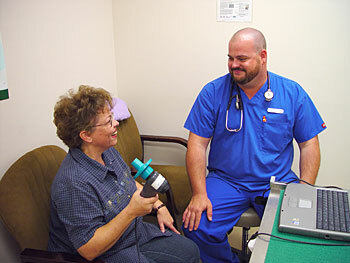 Our physicians provide many services for a range of health conditions. Drs. Bruce Bartlow, Jeffrey Krahling, Sriram Sambasivan, Iyad Mansour, and Edward Zawada are board certified by the American Board of Internal Medicine in internal medicine and nephrology with decades of experience in caring for patients with chronic kidney disease and kidney failure. Consultation and management of acute kidney failure and Hemodialysis on patients in all of our community hospitals. Drs. Rafael Lupercio and Muna Omar are board certified in pulmonary disease with particular expertise in the management of asthma and chronic lung ailments. Dr. Lupercio has a special interest in the diagnosis, management and treatment of patients with pulmonary hypertension. He has lectured abroad on the subject and participates in local trials for new therapeutic agents. Our members have over 150 years of combined critical care experience. Drs. Bartlow, Krahling, Lupercio, Sambasivan, Omar, and Zawada are board certified in critical care medicine. With an aging population and a nationwide shortage of critical care specialists we are proud to treat and serve the patients in our community who have a variety of life threatening illnesses (see attached link for crisis in critical care). As critical care specialists we have cross trained in other specialties including Pulmonary Diseases, Nephrology, and Internal Medicine. We provide a broad and comprehensive system approach to our patients keeping the quality of life and family support as our main goal. Shasta Critical Care Specialists support progress in medicine with participation in national professional groups, publications and workshops throughout the country. The physicians at Shasta Critical Care Specialists deliver lectures and community education throughout the area including the pacific coast, Mt. Shasta, Susanville, and Alturas as well as local hospitals. The range of topics is broad including medical ethics and end-of-life considerations to COPD and pulmonary hypertension. Learn more about available speakers. Members of Shasta Critical Care Specialists are credentialed with UC Davis as Assistant Professors of Medicine and they are actively involved in teaching the Family Practice residents at Mercy Medical Center, Redding.